(CNN) -- China plans to make "every effort to rescue" a merchant ship and crew hijacked in the Indian Ocean, the country's state news agency reported on Tuesday. 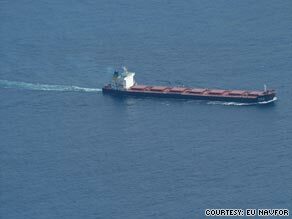 The Chinese-owned bulk carrier De Xin Hai was hijacked on October 19 with 25 crew members on board. Foreign Ministry spokesman Ma Zhaoxu, speaking to reporters, said the government was monitoring developments and has developed an emergency response procedure, the news agency Xinhua reported. Monday's hijacking is the first of a Chinese ship this year, according to the International Chamber of Commerce's International Maritime Bureau. "We will watch closely developments in the incident and make every effort to rescue the hijacked crew and carrier," Ma said. There are 25 crew members aboard and they are all Chinese nationals. A European Union official Monday incorrectly said the total of crew members was 146. John Harbour, a commander with the British Royal Navy who serves with the EU Naval Force, said the UK Maritime Trade Organization in Bahrain called the ship but received no response. An EU force aircraft is monitoring the ship and reported seeing four pirates on deck. The De Xin Hai is owned by the Chinese Ocean Shipping Company and was carrying coal from South Africa to India, Harbour said. Xinhua reported that the total capacity of the ship is 40,892 tons, and that the vessel is 225 meters (246 yards) long. It said that the last time the ship sent a communication was at 4:35 a.m. EDT Monday (4:35 p.m. Beijing time). The ship was dragging two skiffs behind it, much like the kind of skiffs that pirates have been known to use to hijack ships in the waters off Somalia. So far in 2009, 14 ships have been hijacked in the ocean off Somalia's coast, and 33 have been hijacked in the Gulf of Aden, the body of water that lies between Yemen and Somalia, the International Maritime Bureau said. Most of Somalia's coastline is on the Indian Ocean. At present, the bureau knows of four ships that are being held. CNN's Olivia Sterns contributed to this report.